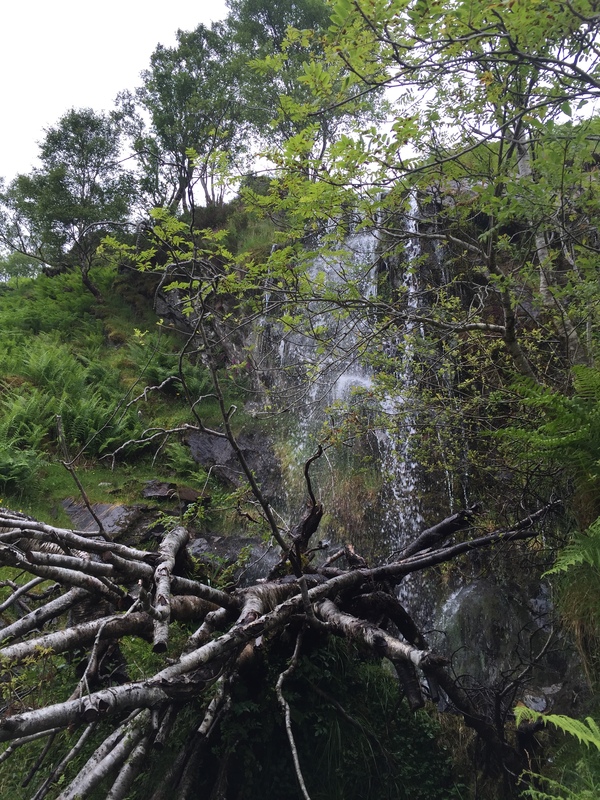 After camping in the fine but midge-ridden Shiel Bridge campsite, we set off to park the van. 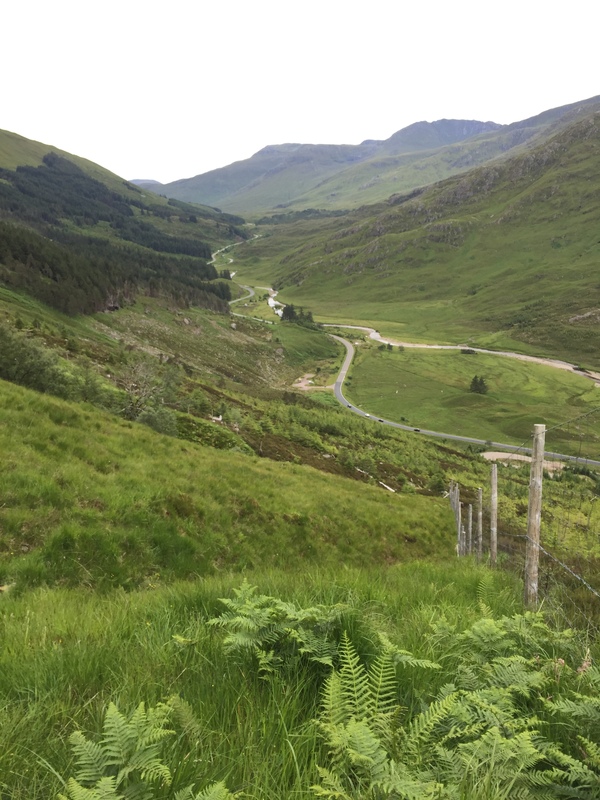 We ended up parking in the layby before the carpark (Shiel Bridge side) for the Five Sisters. 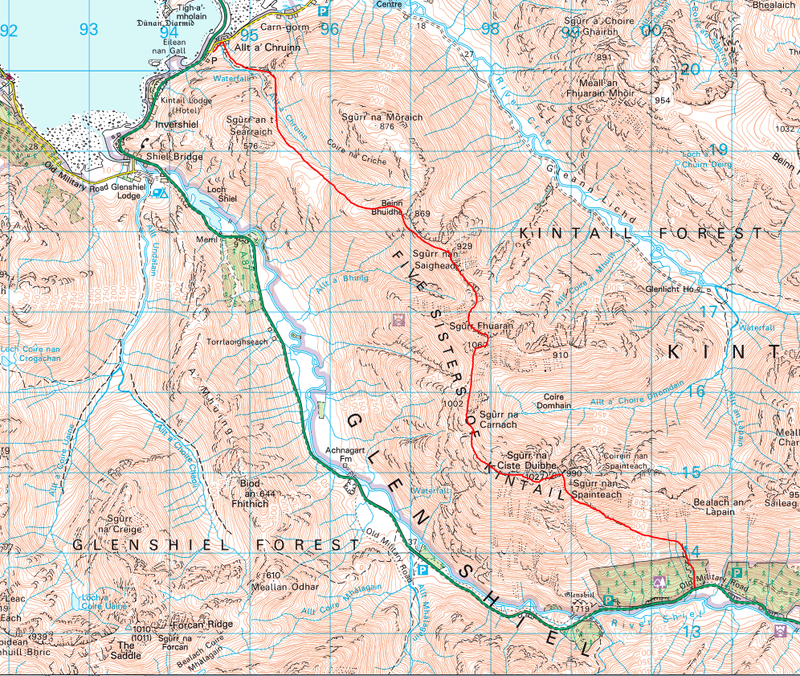 Mainly because we were intrigued by the path heading up on the map, plus a sign pointing up to ‘Hill Path’. 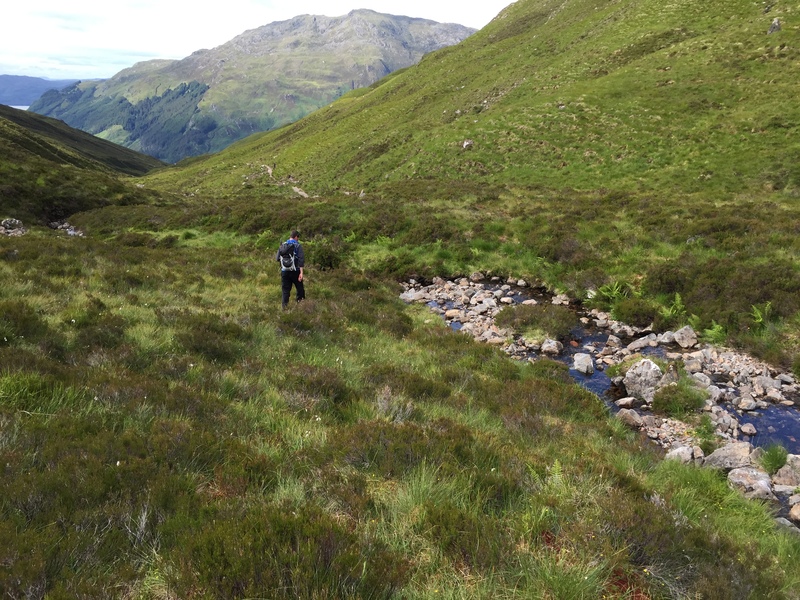 Perhaps this was a better route than the infamous steep slog for 500m – certainly the path looked great, and Ally spotted a group of folk ahead. Well, we decided to see where it took us anyway – it was too tempting. 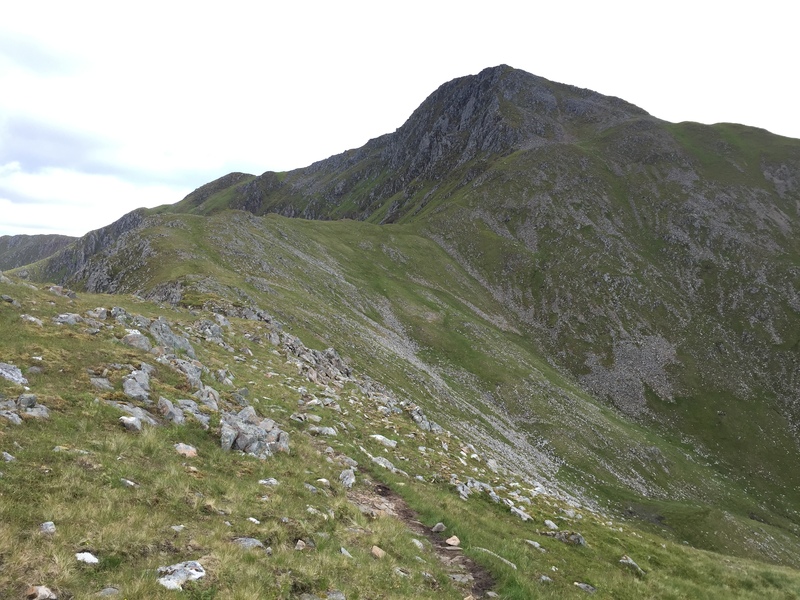 Although weirdly, I quite like a sharp ascent and prefer them to a long downhill slog, I think I had built it up in my mind a bit. 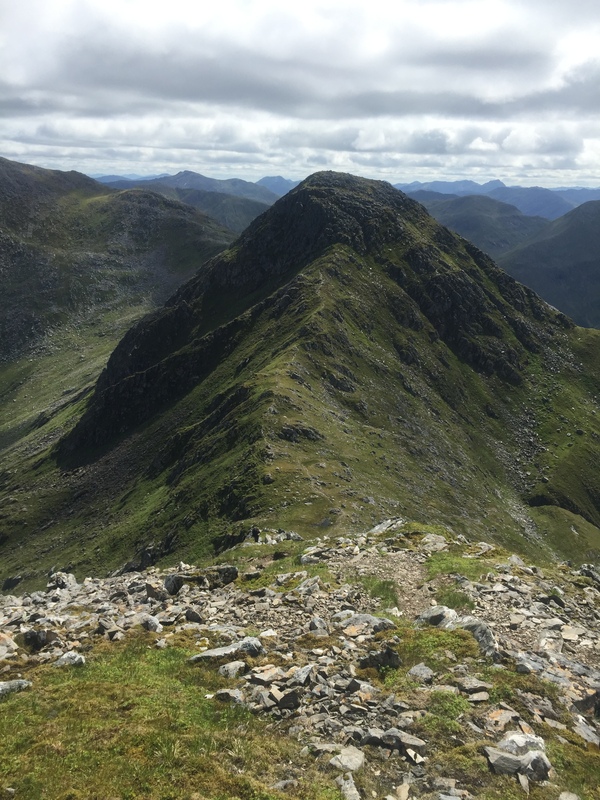 It turned out to be an excellent stalkers path that zig-zagged steeply upwards and then made a gentle rising traverse up towards the ridge. Trying to capture Bertha doon there! 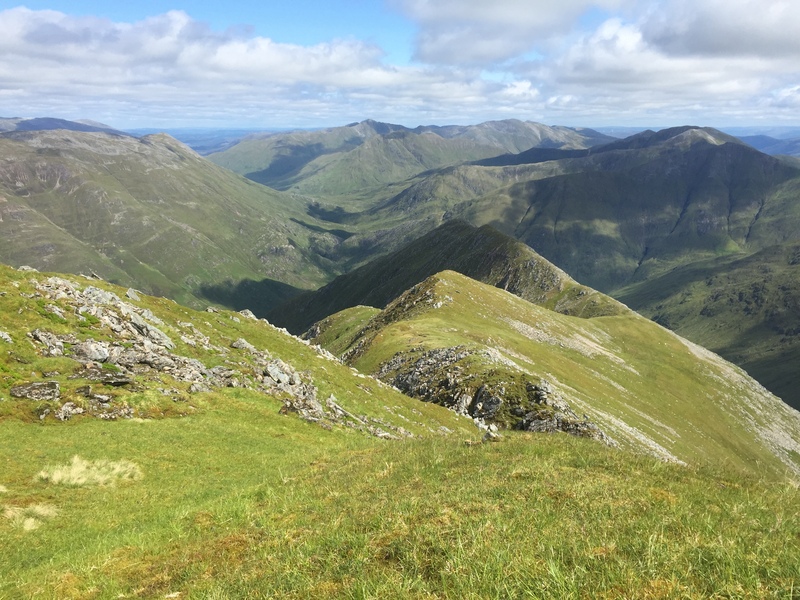 When we saw that it wasn’t going up very steeply we started to get a bit concerned but a check of the map saw that it was leading us to practically the summit of the first Munro, Sgurr na Ciste Duibhe. 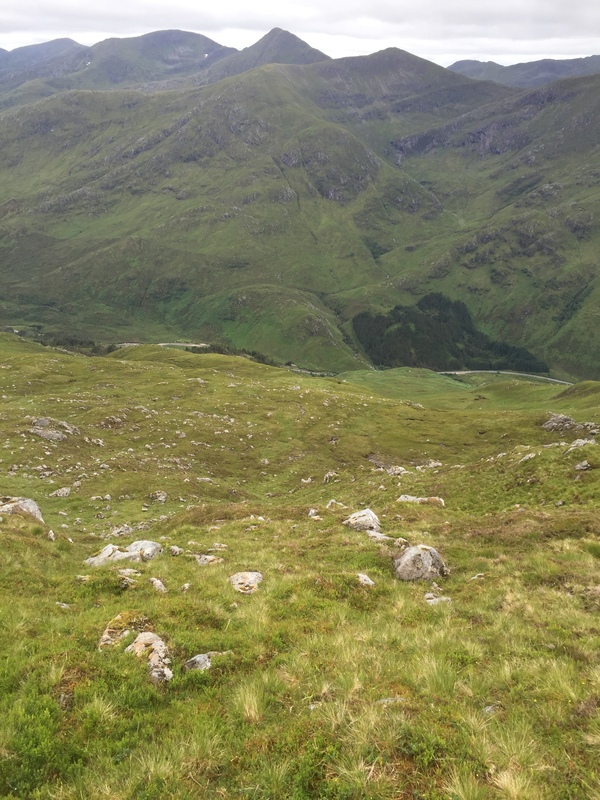 The path levelled out about three quarters of the way up the slopes and then petered out in a boggy bit. We saw the group ahead of us make for a grassy avenue, traversing the slopes towards the summit. We decided to just head straight up. 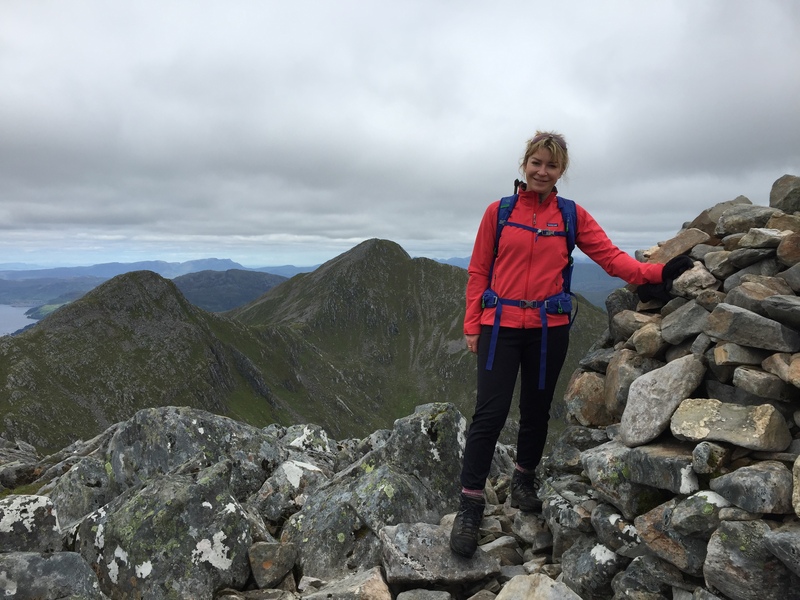 I was keen to get on the ridge – I didn’t come here for grassy slopes and we had already missed out the first part of the ridge! 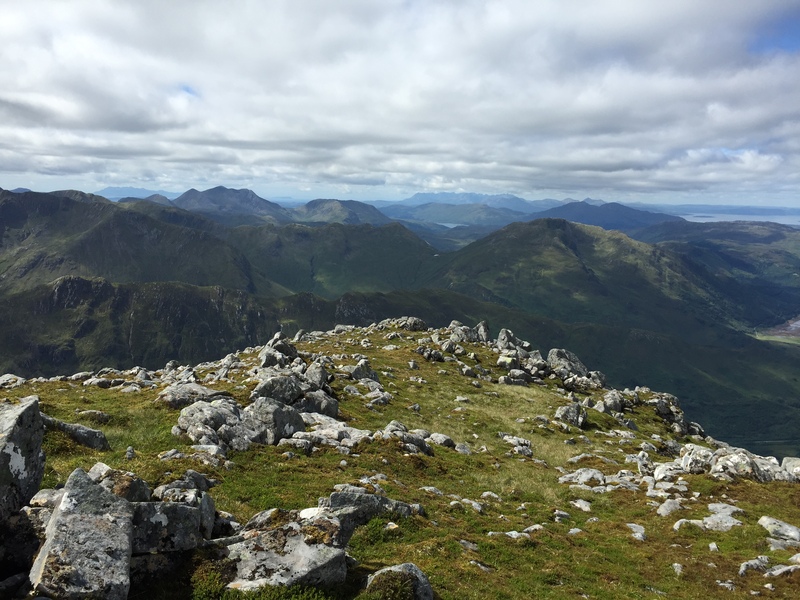 It was a steep and rough but short climb to gain the rocky ridge and from here was a clear path ahead where we could see the three Munro summits ahead of us. 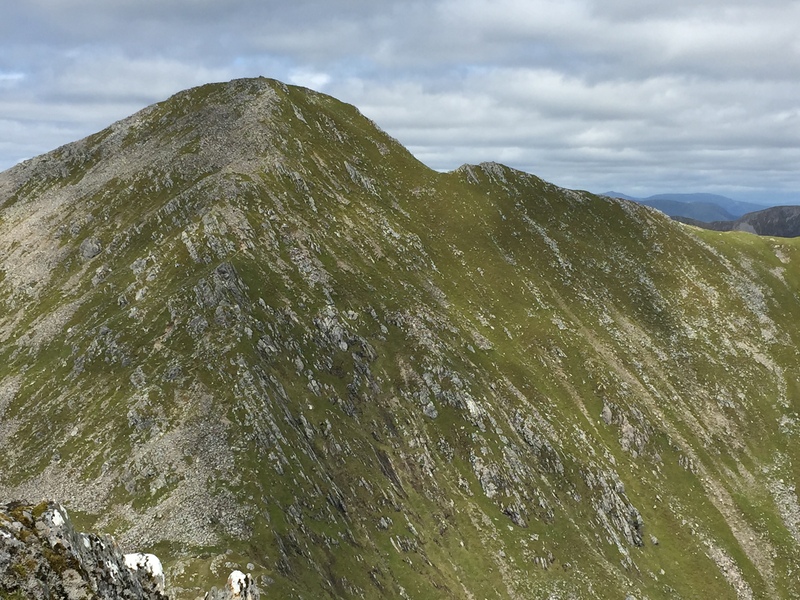 Almost immediately we were scrambling a wee bit, and there was a fairly tricky downclimb to reach the hollowed out bit of the ridge and a scrambly section before the summit of Sgurr na Ciste Duibhe. Perhaps there was a better way, but this was more fun! At least for me – Ally is not keen on exposure! 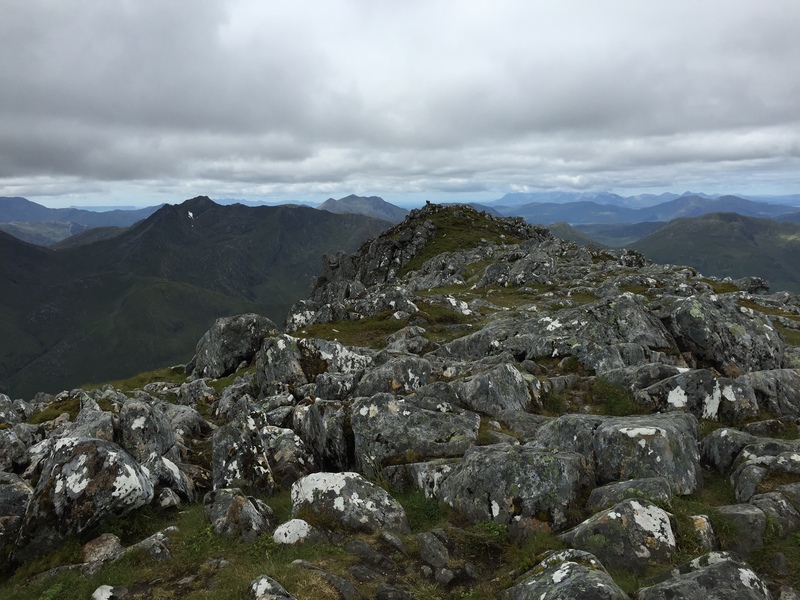 I thought the ridge itself was slightly more complex than the South Shiel Ridge which has a fairly straightforward path with little rock, although this bit was the trickiest of the whole walk and there was nothing else as scrambly. 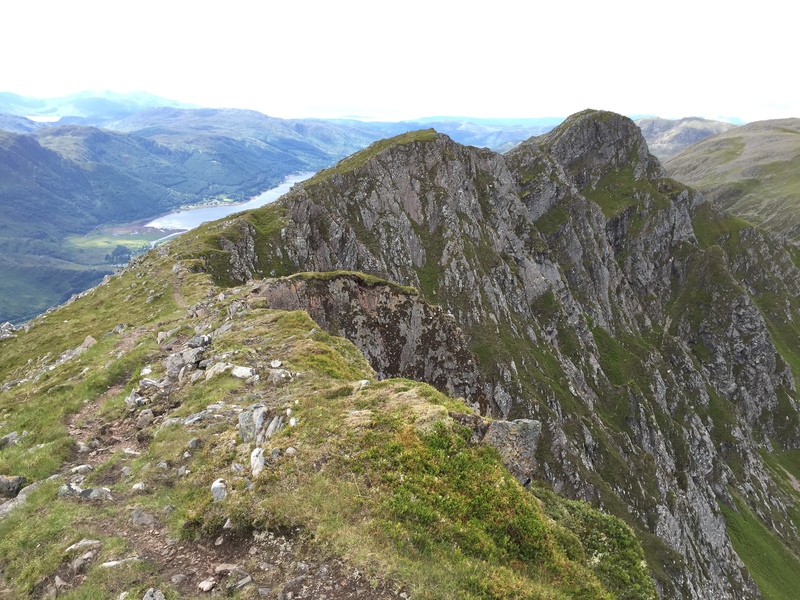 We reached the summit and got a taster of the fantastic ridge ahead of us. 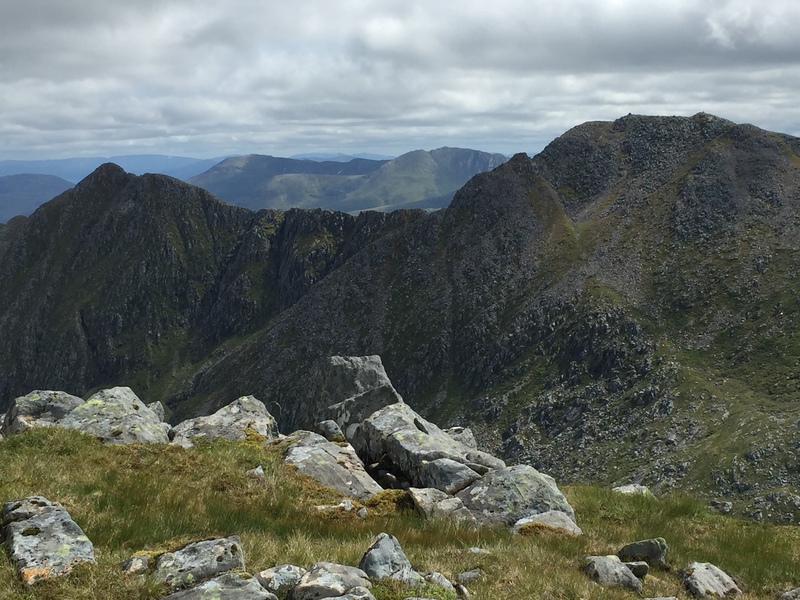 From the summit, there was a steep downclimb, although all on a good path to the bealach where we caught up with the first group of people having a rest. 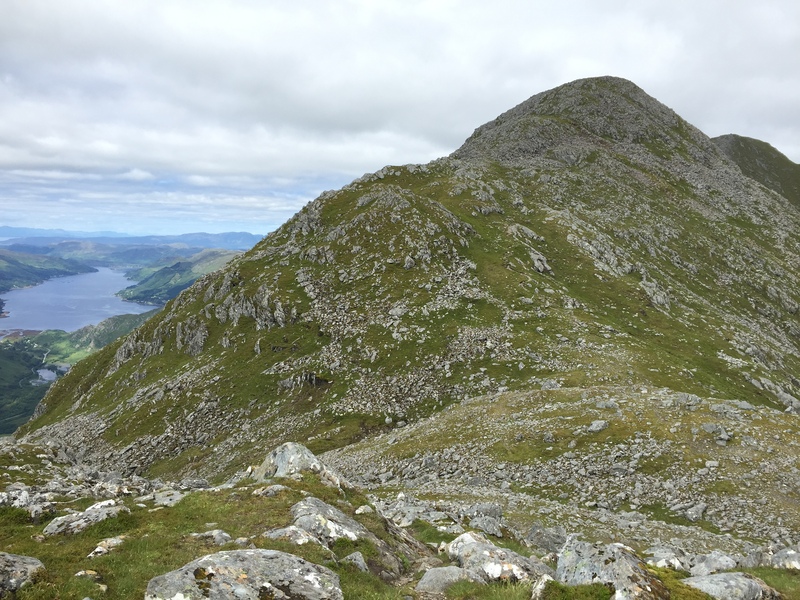 We then began the steep climb up to the second summit of Sgurr na Carnach . 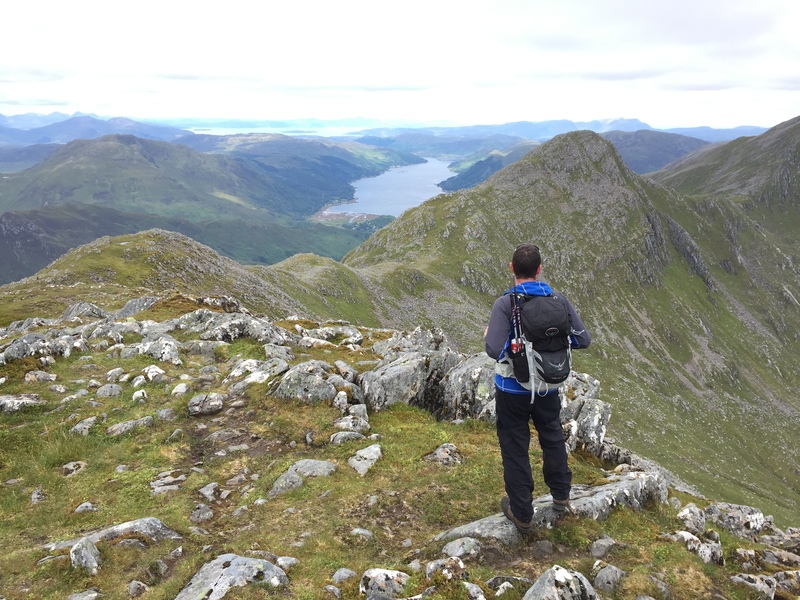 The ridge was wonderful – all around were just stunning views. What a day. At the summit of Sgurr na Carnach there was a large group of women and their guide and the first group also caught up with us, so it was fairly crowded and full of chatter. We sat for a while and had a break. There were just breathtaking views. We could see across to Torridon, Skye, Rhum and Eigg. The day was brilliant. 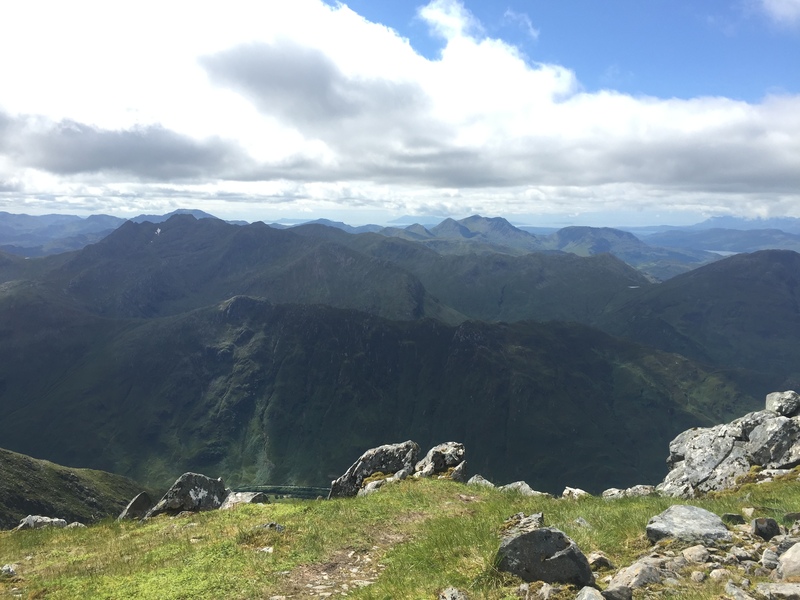 We made our way to the last and final Munro, Sgurr Fhuaran. Ally and I had attempted to climb this some years ago in winter from Glen Lichd. We were with a larger group of people and had got within 50 feet of the summit when one of the party threw a wobbly and freaked out with the exposure. Plus he had his old dog with him who was not ridge savvy! 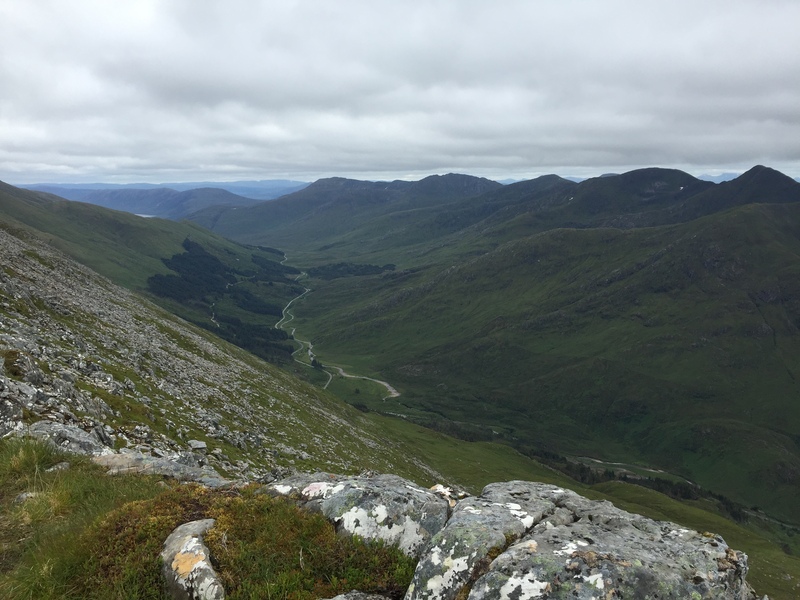 So we ended up retreating – god it was a long and tiresome way down! 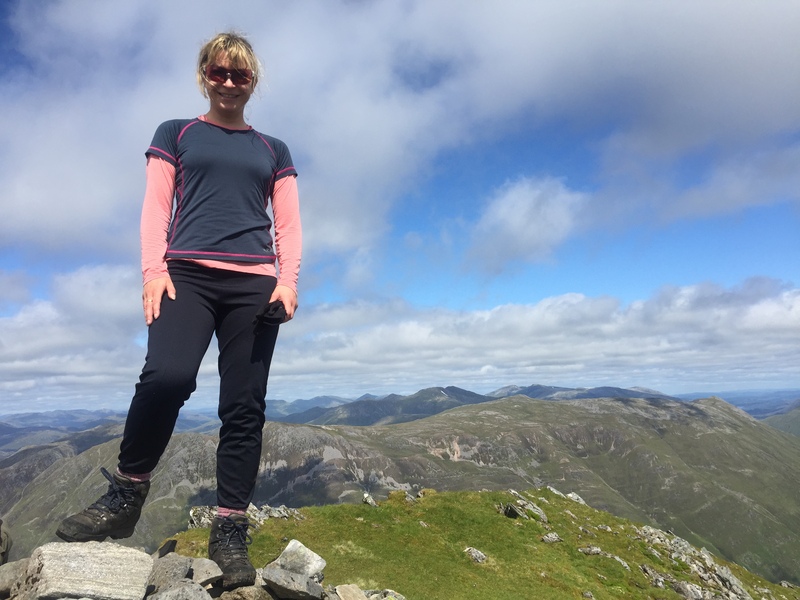 So we had unfinished business with Sgurr Fhuaran and it was great to finally stand on the summit. 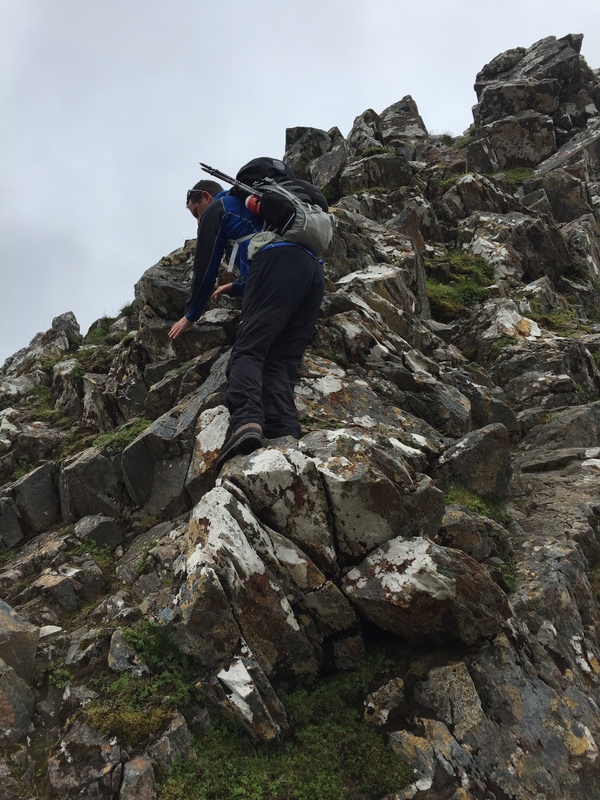 It was a very steep pull but great fun and just gorgeous views again – we really were rewarded at the top and stopped again to take it all in. 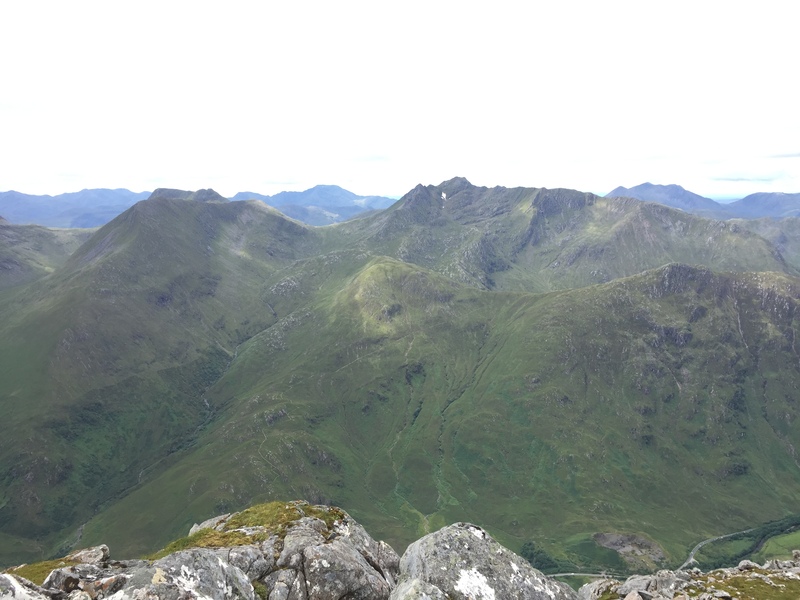 360 views, from the ridge behind us to the far North and Torridon. It was just the best day out in a long time. 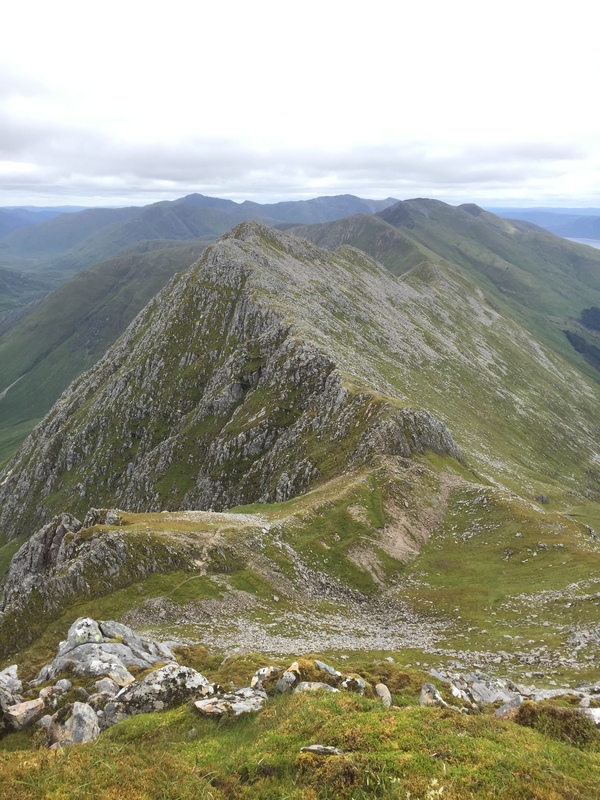 However, we were not purists and did not complete the entire ridge walk, deciding to descend down the NW ridge of Beinn Bhuidhe and missing out the final Sister of Sgurr na Moraich. Its perhaps something I’d like to go back and do someday – although there is so much to do as it is. Ally was keen to get down though and we had a long and rough descent down to where we finally crossed the burn and picked up the path on the other side. 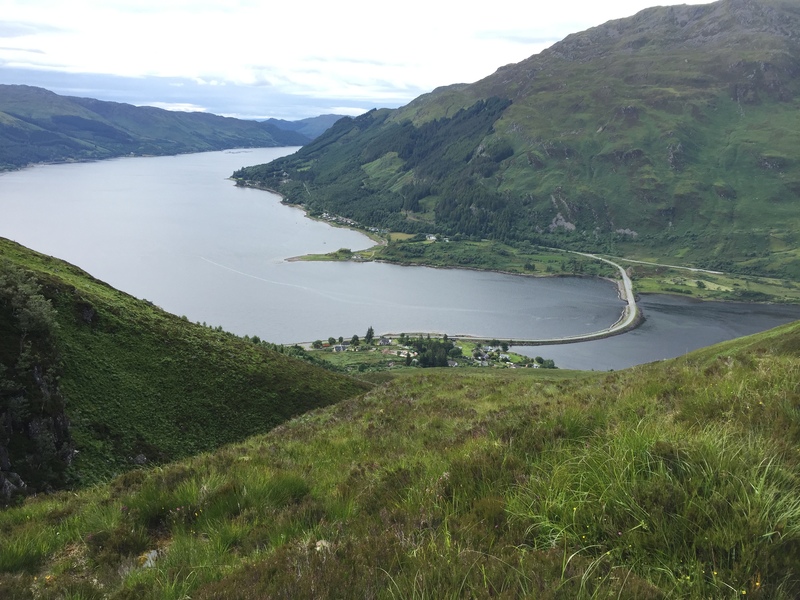 At least on this bit there was a decent path as it would be a very rough descent without, and we had lovely views of Loch Shiel ahead. Even so, it went on forever and we were pretty relieved when we finally reached the road. 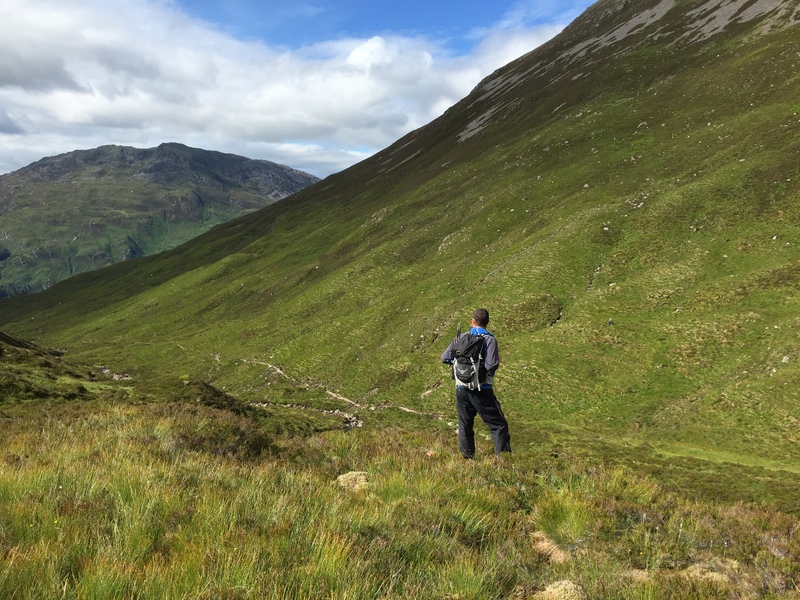 Looking back – we were up there! At the road, there was a man by his car looking up to the Sisters with his binoculars. He told us his wife was one of the party with the guide that we had met on the second summit, and he was waiting to drive them back to the start. We said that they were about an hour behind us. He then asked if we would be wanting a lift then. I could have hugged him! We were intending to hitch, and although I quite like the fun of hitching Ally hates it so we were very grateful. The way back in the car seemed very long, and at one point I nearly had the poor guy screeching to a halt as I spotted a Bertha Bongo lookalike in the layby before where we had parked and told him to stop. Ally noticed just in time – oops! 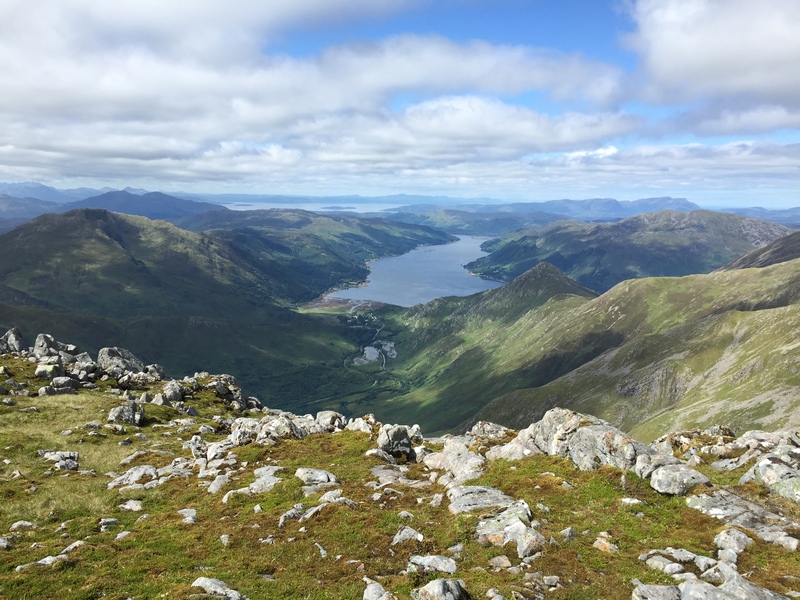 What a brilliant day – and the pint tasted great in the Kintail Lodge Hotel afterwards. 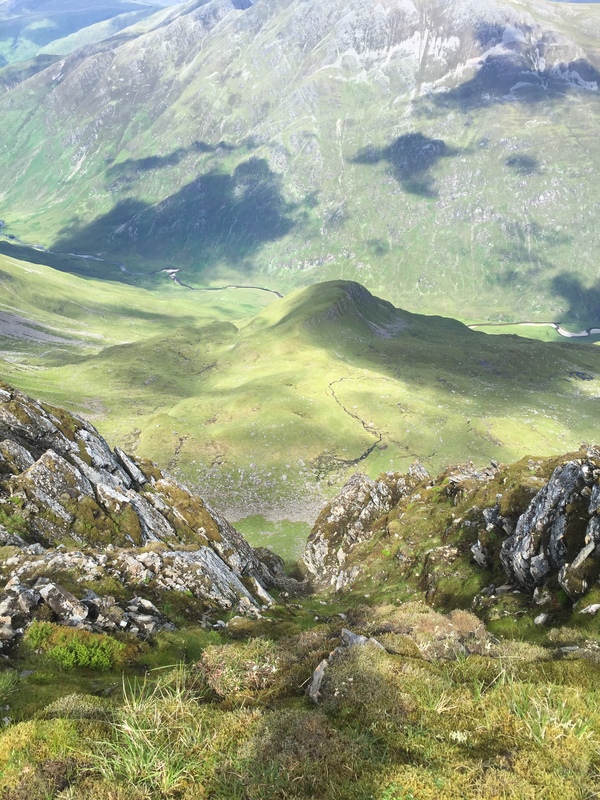 A classic ridge walk indeed. Ahh loved it! Even more than I thought I would. Decent weather helped too.. I have to admit I absolutely hated the 5 Sisters – I found them really scary. Interesting to note about the stalkers path up which would miss out the ‘bad step’ off Spainteach (although I did like the rest of Spainteach). 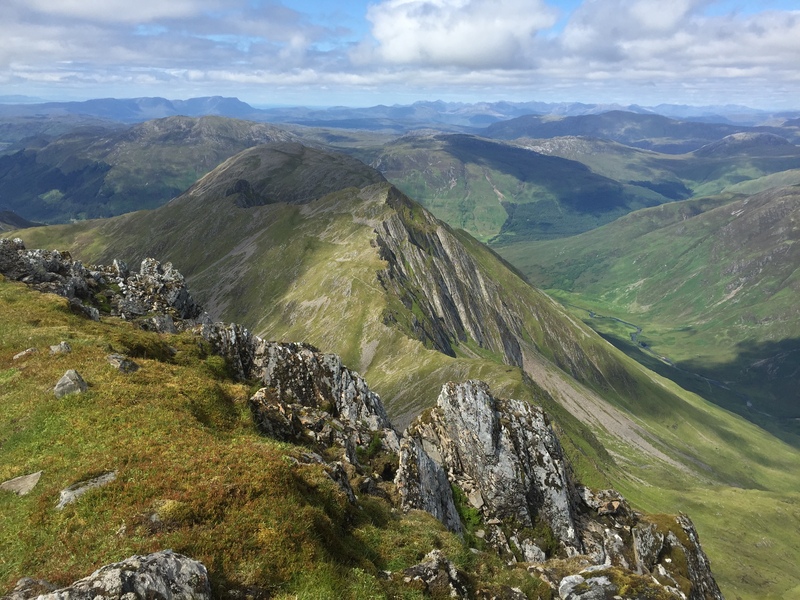 I was a bit sorry when I had to go back up the Morvich end of the Sisters ridge as I’d missed Saighead out originally and needed it for my top-bagging. 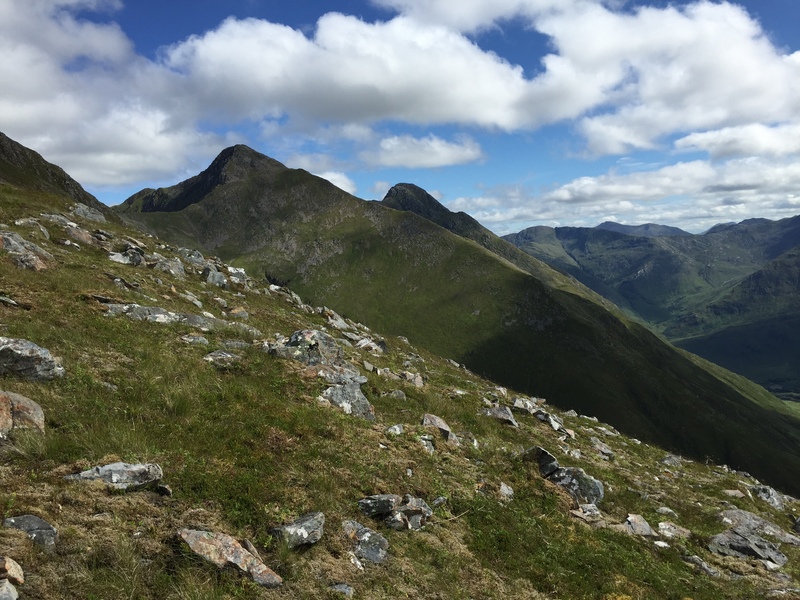 At least the return to that end of the ridge meant I got to do Moraich which is a lovely hill from the col and back and gives great views of the Sisters ridge on the way back to the col.
Ah, I wonder if that was the bad step we hit then – the tricky downclimb bit? 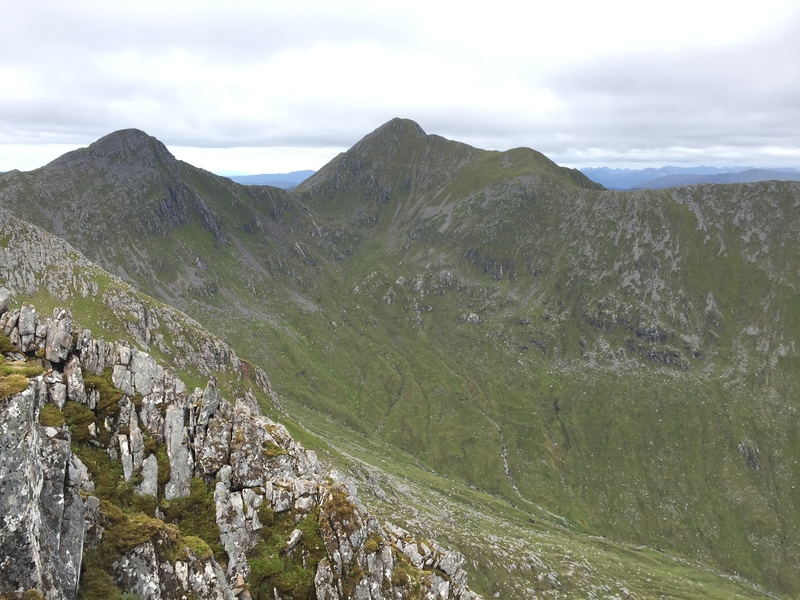 I wasn’t entirely sure whereabouts we hit the ridge but knew it was between Spainteach and Sgurr na Ciste Duibhe. Or maybe it was in fact an easier bit than the bad step! 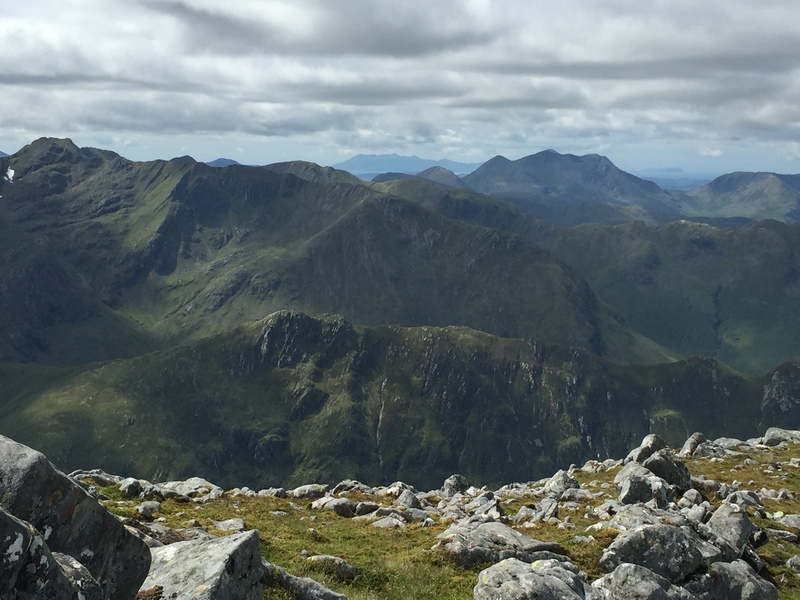 Yeah, shame we missed out Moraich – I may go back one day and do the ridge in its entirety! 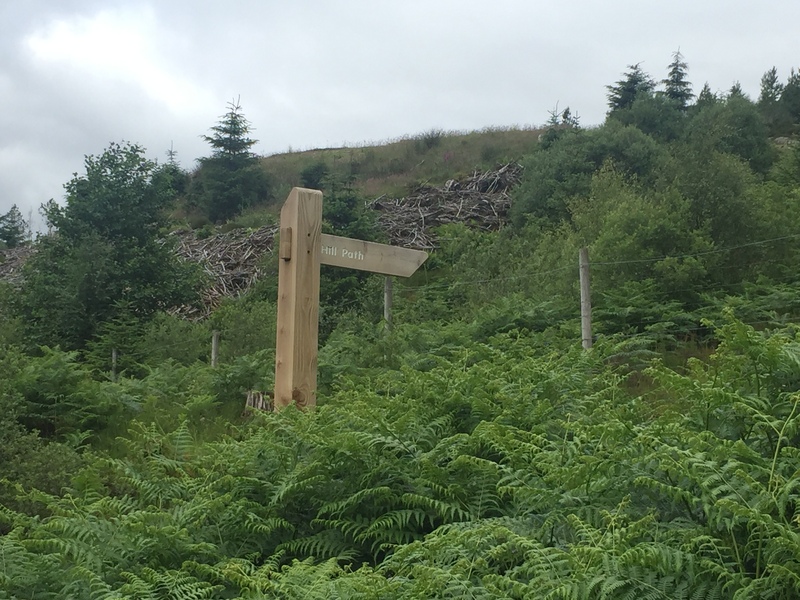 Looks a great walk, it’s always the getting back that puts me off these kind of days out.